Imagine a world where there is so much information coming at you that you just can’t handle it; you decide that it would be better to simply avoid information that doesn’t make you happy. The world in this book is that world. And so is the real world, or at least it seems plausible that we are heading there. In recent years we have seen a louder and louder call to silence critics or people we don’t agree with. From de-platforming on college campuses, to blocking and banning on social platforms, to campaigns to fire people from their jobs for things they have said outside of work, to trying to get books banned, to making speech illegal if we find it hateful, we are definitely on the road to more censorship, rather than less. 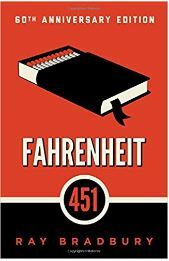 Bradbury provides this world for us: a world of happy thoughts (or else) and complete control by a police state that regulates not only how we relate to others but entertainment and learning as well. Bradbury was ahead of his time in more than just the call to be wary of totalitarianism. His ideas of wall sized screens (instead of TVs) and interacting with those actors directly was prescient. The idea that we would, as a society, choose to burn ideas (books) on our own, that we would self-medicate (ala Brave New World) and that only true freedom would be outside the system all stay with the reader long after the book is over. I’ve read this book before and, while the story isn’t great, the points the author makes are true and definitely worth being reminded of. Scott Asher is the Editor-in-Chief of BookGateway.com and a believer, a husband, a dad, a geek, an artist, a gamer, a teacher, a learner and tired.